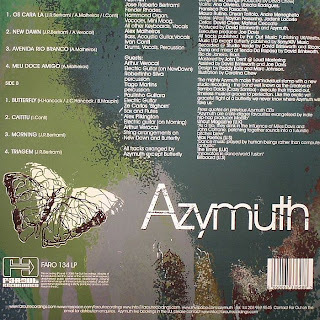 Jazz Station - Arnaldo DeSouteiro's Blog (Jazz, Bossa & Beyond): Vinyl of the Day - "Azymuth: Butterfly"
After three years performing Herbie Hancock's "Butterfly" in live concerts with Ithamara Koorax all over the world, Azymuth's keyboardist José Roberto Bertrami decided to suggest to London-based impresario Joe Davis (head of Far Out label) that the group should record it on their next album. 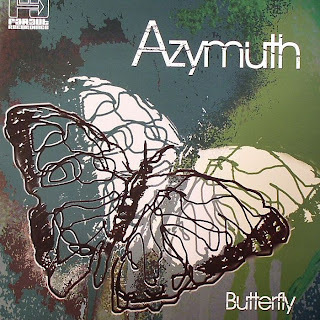 Now released both on CD and LP formats, with "Butterfly" used as title track, this turn out to be Azymuth's best album during their Far Out era. "Butterfly" is also the opening tune of the CD, but appears as the first track of Side B on the vinyl version. To kick off Side A, Davis and producer David Brinkworth chose "Os Cara La", with a hypnotic funk groove propelled by Alex Malheiros' pumping bass and Ivan Conti's thundering drums, sounding reminiscent of their best work for Milestone in the early 80s. The three musicians contribute with strong originals, with Bertrami's "Triagem" being the most efervescent one. Bertrami's keyboard arsenal includes Fender Rhodes, Hammond, Vocoder, Mini Moog. Alex doubles on acoustic guitar. Ivan is also heard on percussion. Arthur Verocai wrote string scores for "New Dawn" and "Butterfly", besides adding electric guitar to the remake of "Morning" (Manhã), originally recorded in 1975 for the Som Livre LP which included "Linha do Horizonte." Other guests: Robertinho Silva, Tiago Martins, José Carlos "Bigorna" Ramos (Zé Bigorna), Paulinho Guitarra and Alex Pilkington.